Gorgeous cookies, huh? Soft and chewy dough filled with gooey caramel and sprinkled with sea salt...a rather brilliant creation from Liz, a girl after my own heart when it comes to passions (aka running & dessert!). It's the first day of December, meaning it's time to start thinking about your Christmas cookie offerings for 2011! I'll be sharing a few cookie recipes with you between now and Christmas, but this is one that definitely deserves a spot on your list! I admit it, I've completely fallen captive to the salted caramel trend (exhibits A, B, & C). Overdone? Maybe. But based on what I've seen on Pinterest, my magazine subscriptions, and other blogs, I'm not the only one who can't get enough of the combination! When you make these, be sure to cover the caramel with the dough completely before baking...or else you'll have some caramel trying to sneak out like you see in the picture above! 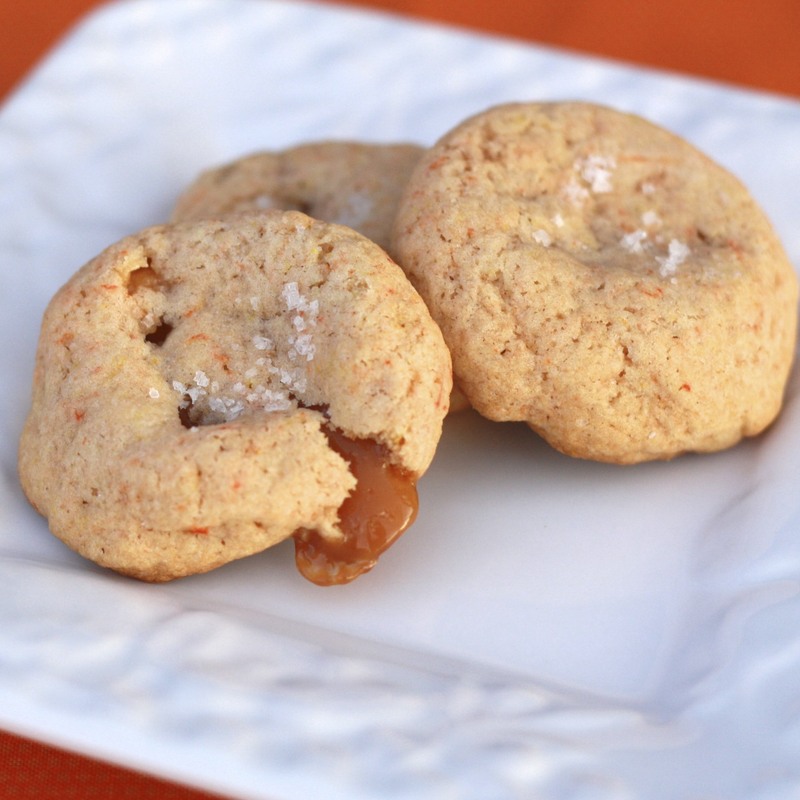 These are best warm so that the caramel is gooey, but if you want to make them ahead of time, just zap the cookies in the microwave for 15-30 seconds and serve! 1. Preheat oven to 375F. Line 2 baking sheets with parchment paper. In a mixing bowl, beat butter and sugar until creamy. Mix in egg, vanilla, and milk until combined. 2. In a separate bowl combine pudding mix, flour, baking soda, and baking powder. Add to wet ingredients, mixing until combined. 3. Roll dough into 1-inch balls. Flatten each ball of dough and place an unwrapped caramel on it. Wrap dough around caramel to cover completely. Place balls of dough on prepared baking sheets and sprinkle with sea salt. 4. Bake for 10 minutes until edges are lightly browned. Remove from oven and sprinkle with additional sea salt, if desired. Allow to cool for 5 minutes before transferring to wire racks to cool completely.